Green River installs spray foam insulation in homes and buildings. 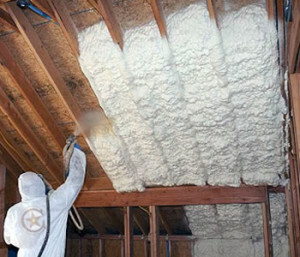 Why choose spray foam insulation over more conventional insulation products? Spray foam insulation is the smart choice, offering a wide range of benefits that no other insulation product can match. 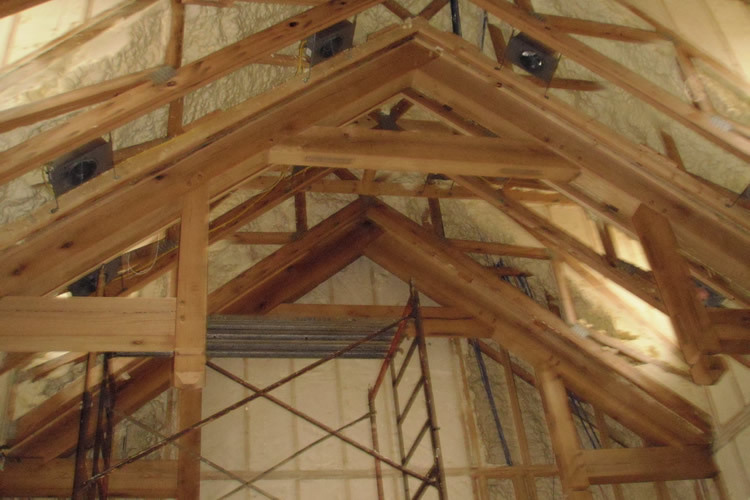 Spray foam insulation is energy-efficient and durable, helping to create a comfortable environment, keeping buildings warm in winter and cool in summer. SPF insulation is known to resist heat transfer extremely well, and it offers a highly effective solution in reducing unwanted air infiltration through gaps, cracks, seams, and joints. Because it is sprayed directly into the gaps, cracks, seams, joints, and other surfaces that contribute to energy loss, spray foam both insulates and air seals, offering an easy and effective way of weatherizing existing buildings and new construction. There simply is no better insulating material! Spray polyurethane foam is a spray-applied plastic that can form a continuous insulation and air sealing barrier on walls, roofs, around corners, and on all contoured surfaces. It is made by mixing and reacting unique liquid components at the job site to create foam. The liquids react very quickly when mixed, expanding on contact to create foam that insulates, seals gaps, and can form moisture and vapor barriers. There are two commonly used kinds of spray foam: 0.5 lb/cubic ft open cell foam (half-pound foam) and 2.0 lb/cubic ft closed cell foam (2 pound foam). Open cell is a type of foam where the tiny cells are not completely closed. As a result, air fills all of the open space inside the material, making the foam somewhat flexible and sponge-like in appearance, similar to a couch cushion. Closed cell foam insulation is much denser than open cell, with a smaller, more compact cell structure. Its tiny foam cells are closed and packed together, so that it is rigid in appearance. The cells are filled with a gas that helps the foam rise and expand and become a greater insulator. Which Foam Should You Choose? When applying spray foam at your home or commercial building, you must first decide whether you will use open-cell foam or closed-cell foam. This choice can make a big difference in the job cost, application method, and product performance. The first major factor to consider when selecting which foam type is the actual nature of the foam. Both open and closed cell spray foam out perform traditional insulation types, providing excellent thermal insulation and sound resistance while also air sealing. Open cell is less expensive because it expands much more when applied–about 100 times it’s size! The second major factor to consider when selecting which spray foam type to use is how the characteristics of the foam align with the actual application area and the desired results. R-value means “resistance to heat flow”. The higher the number, the better it insulates. Closed cell foam has a higher R-value per inch, about R-6.8, and can be used to achieve higher insulation levels in shallow wall cavities or other areas with limited available space as a result. Open cell foam has an R-value around R-3.6 per inch. Although open-cell foam is a good air barrier, it does not block the movement of water vapor. It is most often used for interior walls, attic floors, and the underside of roof decks above the attic space. We don’t generally recommended closed cell 2 pound spray foam for exterior applications like crawlspaces. 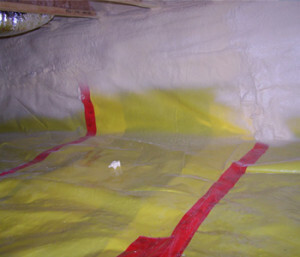 Closed cell spray foam insulation is a very good air barrier and a water vapor barrier. A “three pound foam” formulation is often sprayed onto flat roofs to better support traffic and loads. Two pound closed cell spray foam is also used in crawlspaces or other exterior applications due to its ability to block water vapor movement and its resistance to mold growth. In some humid climate zones, only closed cell type spray foam is used. In East Tennessee we have a “Mixed Humid” climate. We generally install open cell spray foam insulation on above grade surfaces, and only closed cell spray foam insulation on below grade surfaces like foundation walls inside the crawl space. We also install closed cell spray foam on the exterior of foundation walls on houses and commercial buildings, and on below grade basement walls. 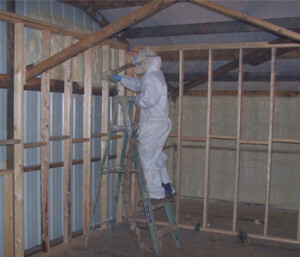 Closed cell spray foam is an excellent and versatile insulation. In both new construction and energy retrofits of existing homes and commercial buildings, it is often sprayed into open wall cavities as a stand-alone insulation. Or it can be sprayed to a thin 1 inch layer to air seal, then the wall cavity filled with fiberglass insulation. This “flash and batt” system is economical and effective. Contact us today at (865) 919-7464 to get our expert advice on which spray foam insulation application is right for your project!